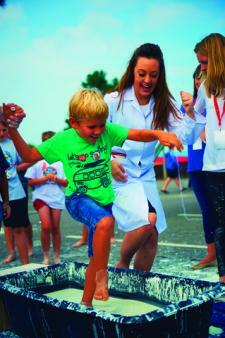 Butlin’s new Astonishing Family Science Weekends are designed to give children aged six to 14 a taste of how science works in everyday life. Lucy Dimbylow visited the Bognor Regis resort with her children Tom, 10, and Katie, 5. Chances are Butlin’s wouldn’t be at the top of your list if you were looking for an educational weekend away for your primary school child. But as we discovered, their Astonishing Family Science Weekends are packed with learning experiences, as well as the family-friendly fun more commonly associated with the resorts. 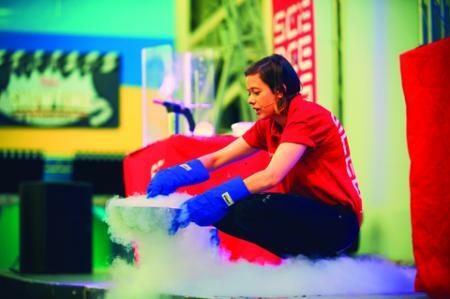 By teaming up with leading science and technology experts such as the Science Museum, Microsoft and the National Space Centre, Butlin’s have put together a packed timetable of hands-on activities, demos and workshops. There’s a growing move for STEM (science, technology, engineering and maths) industries to include art and design (becoming STEAM). That was definitely reflected in Butlin’s programme, which highlighted the overlap between science and art through sessions such as Aardman’s model-making workshop, where we learnt to make our own Gromits under the guidance of the animation studio’s chief model-maker. The main events of the weekend were the three live shows. Stefan Gates, famous for his CBBC food science programmes, brought his Gastronaut show to the stage, teaching us about kitchen chemistry through explosions, edible insects and very smelly cheese, while the Brainiac Live team presented a madcap hour of electrocutions, pyrotechnics and rocket-propelled office chairs – do NOT try these at home! Finally, Aardman’s Animate It! Live involved the whole audience in putting together a show reel of different animation techniques. We packed our weekend with as many workshops and activities as we could fit in, but we also enjoyed the other facilities included in the cost of the break, such as the indoor Splash Waterworld with its bubble pools, waves and flumes, the traditional fairground and play areas. The Astonishing Family Science Weekends are pitched at children aged six to 14, and my Reception-aged daughter was a little too young to get the most out of many of the activities. 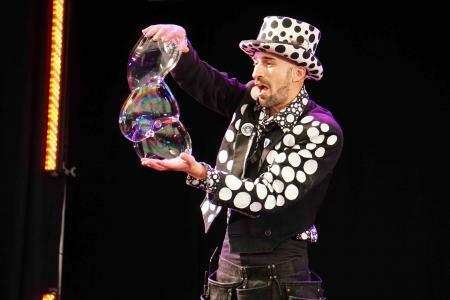 The highlight of her weekend was Samsam Bubbleman’s live show, where the 10 times Guinness World Record holder explained some of the science of bubbles, but mainly entertained a mostly pre-school crowd with 45 minutes of bubbles of all shapes and sizes, ending with an energetic bubble party. Aardman’s live show also ticked Katie’s boxes – rather than sitting still for an hour, she was able to get involved with holding props, making farmyard noises and generally jumping around. The best family workshop for EYFS children was the Great Rocket Challenge, presented by the National Space Centre, where we had to build our own air-propelled rockets – from selecting the right materials to the final launch-off against other families. There are loads of hands-on activities for KS1 children to. We enjoyed learning about the chemical reactions involved in making lip balm, and choosing our own ingredients to make a sample to take away. The Science Museum’s live demos were a big hit, using Pringles can rockets and that famous tablecloth trick to introduce Newton’s laws about forces. We also got stuck into the Science Museum’s drop-in activities, which included practical experiments such as a giant buzzwire and Alka Seltzer rockets. Budding Tim Peakes would enjoy the National Space Centre’s presentation on the science and history of rockets, while fans of the Horrible Science series mustn’t miss the chance to master gruesome drawing techniques from series illustrator Tony De Saulles. The Astonishing Family Science Weekend really comes into its own for KS2 kids. Year 5 Tom simply couldn’t pick his favourite activity from the many he tried out over the weekend. He particularly liked the I’m a Rock and Roll Lighting and Sound Designer workshop, where he got to use a real sound desk and performance lighting control system. 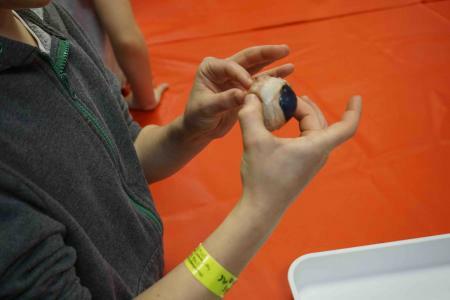 I’m also told that the Eyeball Dissection session with @Bristol went down well, although I delegated the supervision of that activity to my husband! KS2 children with a passion for technology are well catered for, with a variety of workshops including code-breaking with Bletchley Park and introductions to computer coding with Microsoft and the BBC micro:bit. As a bit of fun, we booked Tom a Ninebot session. He loved zipping around on these nifty hands-free hoverboards, descendants of the Segway, and learnt about forces in the process. There were also other KS2-suitable activities that we didn’t get time to try, including pinhole photography, the science of invention, and Zombie Science – a must for any child who wants to see what happens inside a zombie brain! The absolute highlight of the weekend for Tom was the Walking on Custard experiment. He spent over an hour running, jumping and hopping barefoot across a tank of custard, learning about its non-Newtonian properties. It was tucked away in a tent at the corner of the fairground, so was easy to miss but well worth seeking out. As parents, our favourite workshop by far was the Aardman model-making session. This is a paid-for activity but was worth every penny – okay, so our children needed a lot of help to make their plasticine Gromits, but we were blown away by the results. We’d also recommend spending some time in the Centre for Computing History’s area, where kids can experience what computers and gaming were like in the 1970s, 80s and 90s. It was highly amusing to witness Tom’s horror at the machines we used to use, and a brilliant journey back in time to the technology of our own childhoods. Our weekend included Premium Dining passes, which entitled us to buffet breakfast and dinner in the bright and modern Deck restaurant. There’s also a cheaper Food Court dining plan. If you’d rather pay as you go, there are plenty of child-friendly options, including Papa John’s pizza, Burger King and the 50s-themed Diner, plus a pub, ice cream parlour and coffee bars. There’s also a mini-market if you’re self-catering. Butlin’s Bognor Regis, Upper Bognor Road, Bognor Regis, PO21 1JJ. Butlin’s Minehead, Warren Road, Minehead, Somerset, TA24 5SH. Butlin’s Skegness, Ingoldmells, Skegness, Lincolnshire, PE25 1NJ. The next two Astonishing Family Science Weekends are taking place at Skegness on 10th June 2016, and at Minehead on 16th September 2016. The majority of the science activities take place on the Saturday and Sunday so your child won’t miss out if they have school on the Friday and Monday. The weekends cost from £69 per person for three nights on a self-catering basis in a Silver apartment (four sharing). Most activities are included, although there is a small charge for some workshops (£5-£6). Many of the free workshops also need to be booked on arrival. For more information or to book, visit www.butlins.com or call 0330 100 6648. This is a sponsored review brought to you by TheSchoolRun and Butlin's. The opinions are completely the reviewer's own, based on her experience at Butlin’s Astonishing Family Science Weekends where she was a guest of Butlin's. A pop-up shop was selling science-themed goodies including bubbles, books, t-shirts and science kits. The Butlin’s Store offers lots of pocket money-friendly souvenirs, plus there are other shops including a sweet shop and toyshop. It also links in to the Computing, Design Technology and Art and Design curriculum areas.